Worn or poorly functioning brakes have been cited as one of the top mechanical failures that contribute to accidents, particularly rear-end collisions. Your vehicle's ability to stop safely and suddenly without veering outside of your lane is the key to keeping you and your passengers safe. 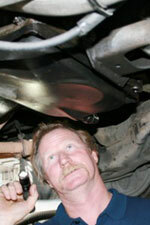 For professional brake repair, service, and maintenance in Santa Rosa, CA, choose Santa Rosa Transmission & Car Care. The braking system is the most important system in your car for auto repair and/or auto service. Brakes are actually energy conversion devices that convert the kinetic energy (momentum) of your vehicle into thermal energy (heat). When you step on the brakes, you command a stopping force 10 times as powerful as the force that puts the car in motion. The braking system can exert thousands of pounds of pressure on each of the four brakes. If your brakes fail, the results can be disastrous. Keeping brakes in good working order is a priority, and we can help make your car safer with a thorough inspection, and if necessary, replace or repair parts to improve your safety and stopping power. Do you hear squeaking or grinding when you engage your vehicle's brakes? Perhaps you've noticed your vehicle pulls to the right or left when braking or you feel grinding as your car slows down. These symptoms indicate you may need to have your brakes repaired. Serving Santa Rosa since 1999, our team takes brake issues seriously. We quickly and accurately diagnose the source of the problem, which may be anything from a brake line leak to worn discs or pads. Once we've discovered the issue, our highly trained technicians will repair it quickly to get you back on the road as soon as possible. Whether you've noticed brake issues developing gradually or need routine brake maintenance, don't delay when it comes to servicing your brakes. The ASE-certified team at Santa Rosa Transmission & Car Care specializes in brake maintenance and repair that will ensure your vehicle's brake system performs well on the road. Speak with a friendly member of our staff today.